Vancouver City Archives, Union Steamship Co. Collection, vol. 30, no. 22. 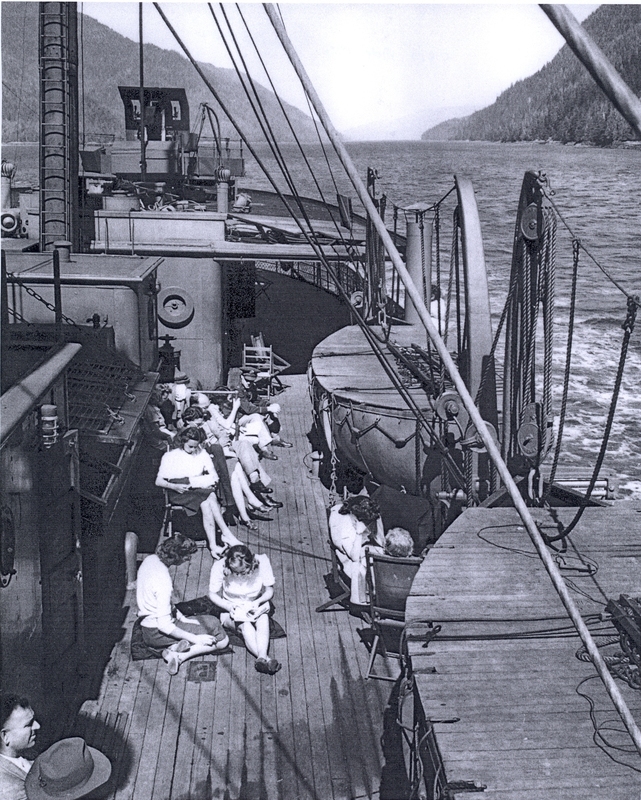 The promotional literature published for the Union Steamship Company of Vancouver adhered to the colonializing picturesque perspective of the mountainous Northwest coast landscape well into the twentieth century. Thus, Aiken Tweedale’s North by West in the Sunlight (1916) describes how his ship ‘passed bays beautiful as the famed Scottish Lochs, – islets as sunny as in the Grecian Seas.’ In Port Simpson, ‘the quaint, snug situation and white houses […] reminded of some village in Devon or Cornwall, but for the towering mountains in the background.’ Then, in 1923, Our Coastal Trips abruptly shifted the perspective to the industrial landscape, drawing passengers’ attention to the coastal paper mills, canneries, and logging operations, with phrases such as ‘canned salmon is very nutritious and contains a greater amount of food element than any other similar product,’ and ‘if it were for nothing else, British Columbia would still be well to the fore on account of this extensive industry.’ Tourists were a side market for the company vessels, which carried loggers, cannery workers, settlers, and canned salmon as well as other cargo, but the focus shifted again in the later 1920s and 1930s as the company’s shipping business began to decline due to the centralization of coastal production. Colourful brochures published on an annual basis now promoted short cruises in the nearby Howe Sound area, as well as the company’s cabins, hotels, and picnic sites on Bowen Island and the Sunshine Coast. The message was that it was essential for overtaxed workers and their families to escape the pressures of urban life and engage in healthful recreation, for ‘there is no invigoration so enduring as a refreshing trip on the open sea and a picnic at one of the enchanting sea-nooks dotted along the pathway of Sunshine and Sea-Charm.’ Thousands of Vancouverites booked passage for moonlight cruises, company picnics, and other excursions during the summer months, until the improvement of the road network into the province’s interior during the post-war period finally brought a sharp decline in the coastal resort traffic. As a result, the Union Steamship Company’s shipping and resort business came to an end in the late 1950s. In examining a half century of the Union company’s tourism material, my paper for the upcoming Environments of Mobility in Canadian History workshop probes into what it reveals about general themes such as tourism and colonialism, welfare capitalism, gender and recreation, and the impact of steam technology on perceptions of the landscape. 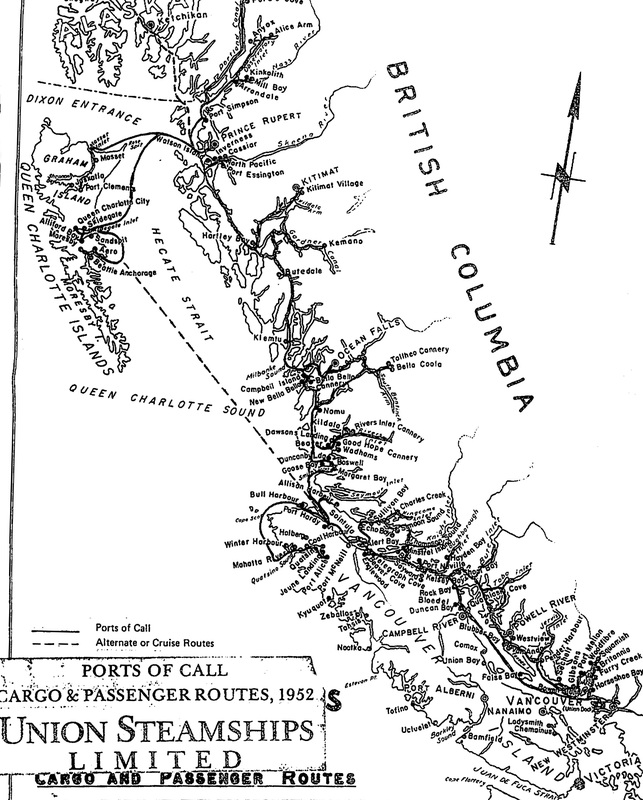 Historians of mobility have tended to assume that steamship travel had much the same impact on the passenger’s perspective as did the railway, but I find that steam did not spell an end to the intimate relationship with British Columbia’s coastal environment due to its many narrow inlets, navigational hazards, and sometimes turbulent seas. I also suggest, however, that the erasure of the coastal inhabitants, Native and non-Native, by this tourist literature foreshadowed the depopulation of the coast with the development of new transportation and communications technologies in the 1950s. Vancouver Martime Museum, Union Steamship Collection, box 1, file 1.